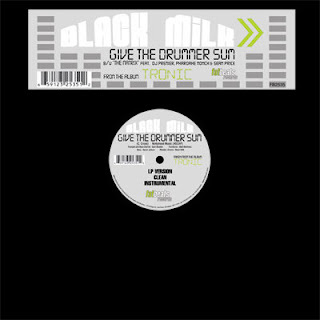 Black Milk's album "Tronic" is one of the most highly anticipated releases of the 4th Quarter, and this lead 12" features two tracks that have brought interest in his work as both a producer and emcee to new heights. "Give the Drummer Sum" features live instrumentation and polished flows, while the b-side features the all-star guest lineup of DJ Premier, Pharoahe Monch, and Sean Price on one of the best posse cuts in recent memory. "Tronic" hits stores on October 28.